After working on both the Ontario and Québec provincial elections with a certain degree of success (and some room for improvement), I decided to dive deep into the rabbit hole that is Canadian demographic data and the electoral history of all 338 districts to build a federal model. I still have some details to work on and variables to polish up, but it is now ready for publication. And so 338Canada.com is now finally online. I will make monthly updates until the start of the federal campaign, which should begin in early September 2019. Projections for all 338 electoral districts are available, with each district having its own page with recent electoral history, basic demographic data and, of course, the map of each district as provided by Elections Canada. There is also an interactive map to offer readers a better visualization of voting intentions across the country. You can visit the map here. The 338 model uses a mostly proportional swing with regional adjustments. For instance, if a party goes from 30% to 33% in the poll aggregate, an increase of 10%, then its score goes up by 10% in every district - if said party is at 15% in district X, then its score goes up to 16.5% (an increase of 1.5 point). But mostly does not mean exclusively. The 338 model also uses demographic data: careful considerations is given to demographics of each district, such as median and average household income, age distribution, language most spoken at home, etc. This data is used to make statistical correlations of voting intention swings between regions and districts. Also, the electoral history of said regions and districts is also taken into consideration - by giving probabilistic floors and ceilings for each political party. Finally, the effect of star candidates is also estimated by calculating the approximate over-performance of past candidates in similar situations (party leader, cabinet minister, high media visibility candidates, etc.). Ultimately, I base this federal model on those I used in Ontario in June 2018 and in Québec in October 2018. 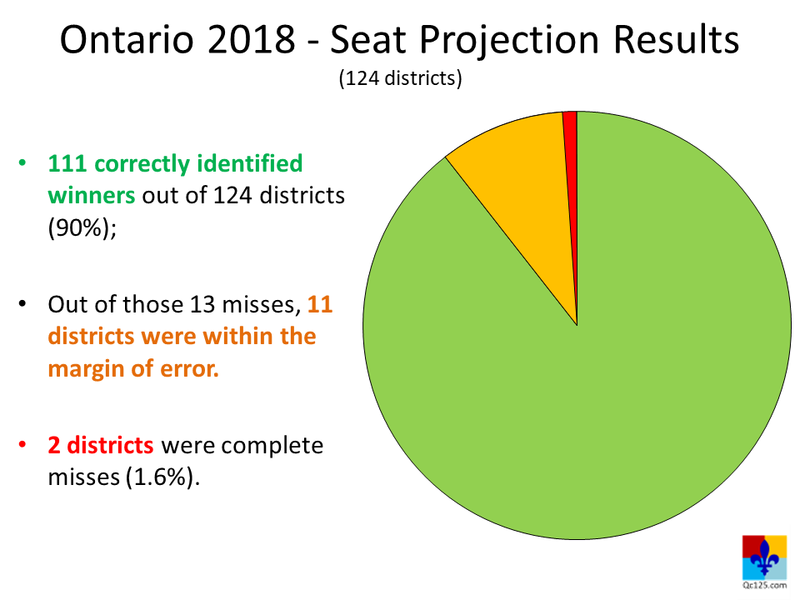 In June 2018, the night before election day in Ontario, I published a projection that showed the PCP led by Doug Ford was most likely going to win a majority government. Out of 124 electoral districts, the model identified the correct winner in 111 of them. Out of the 13 misses, 11 winners had results within the model's margin of error. Only two districts were complete misses. In October 2018, I published a final Quebec projection in L'actualité magazine showing the CAQ led by François Legault was going to win - not assuredly, but most likely a majority. However, the final polls of the election missed the mark a little but by underestimating CAQ support. The poll average for the CAQ was between 31-33% and it won 37% when all the votes were counted. Nevertheless, the model correctly identified 112 winners out of 125. Out of those 13 misses, four were within the margin of error. Nine districts were misses, with most of those going to the CAQ, largely due to the polls underestimating CAQ support (and also very low Liberal turnout). In both elections, my model correctly identified 90% of district winners (111 of 124 in Ontario and 112/125 in Québec) - although the Québec model would have performed even better had polls been more precise (the CAQ was estimated at 32-33% and won with 37% of the popular vote). You can read my post-mortem on the Québec election here (in French). The 338Canada Facebook page is now available here. The rules of conduct on the page are stricter than those you'd expect from a mainstream media comment section: obviously, personal insults, disrespectful language promoting hate and just plain general trolling will result in a permanent ban. Moreover, promotional videos or links, as well as overly partisan content will be removed. Finally, those who promote conspiracy theories or try to attack my credibility will be banned (e.g. : "pwned by Tories" or "Liberal shill" [yes, those are actual examples]). I have no time to deal with such people. You may also follow me on Twitter here. I post in both French and English. Again, those who are disrespectful will be muted or blocked. You may disagree with my numbers and/or analysis, but there are ways to express disagreement without insults. I will gladly engage with people who respectfully challenge my findings. Lastly, I do speak and write in English, but my mother tongue - and the only language I've used up to age 18 - is French. So please be nice to me if I say/write the occasional Frenchism/Gallicism.